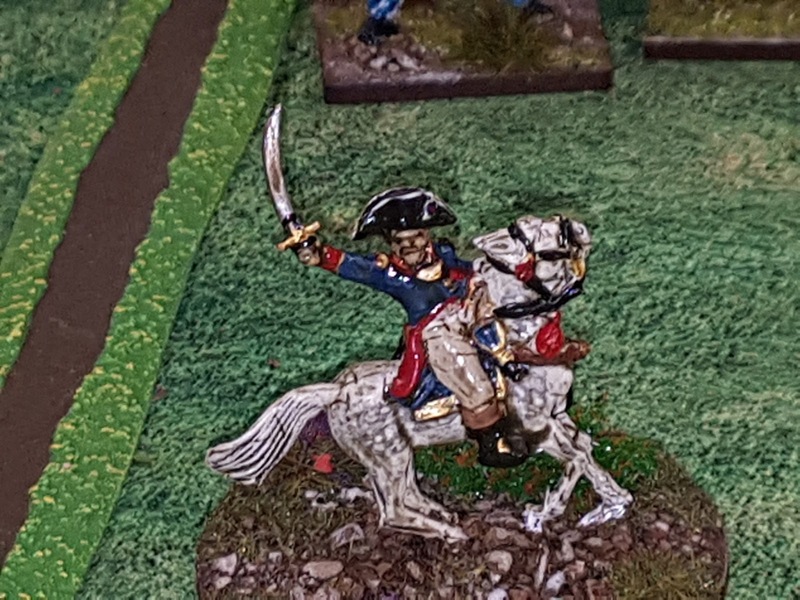 Peter came down the hill last night for the first game in a long time. I recently purchased an excellent little booklet off Caliver Books called "Wellington's First Battle, the Combat for Boxtel 15 September 1794" by Gary David Wills. 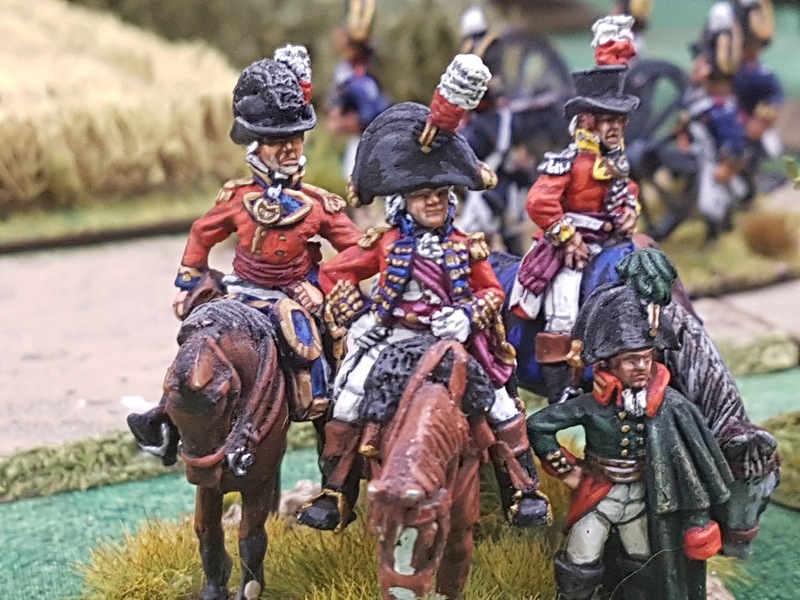 It is written as a wargamers' guide to the battle and provides scenarios, orders of battle and background detail for players of both Black Powder or Volley and Bayonet. 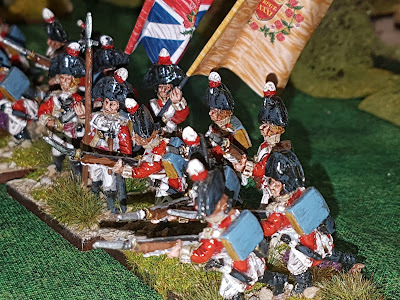 The battle hardly gave Wesley or indeed the entire English force the chance to cover themselves with glory. A strong reconnaissance in force by the French drove in Hessian and Emigre outposts and captured Boxtel. The Duke of York ordered Sir Ralph Abercrombie to recover the town with the Guards' Brigades, the 3rd Brigade (under Wesley) and 10 squadrons of cavalry. 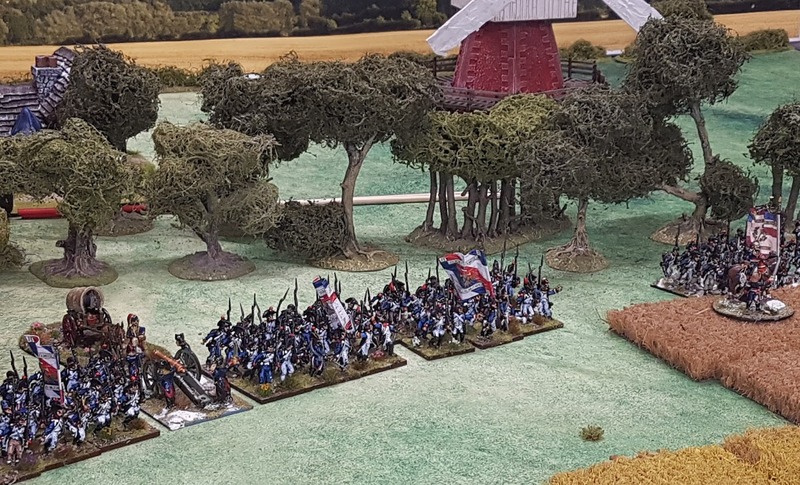 The French and came upon Abercrombie's force and after a brief exchange of fire the latter withdrew, covered by the 33rd Foot. 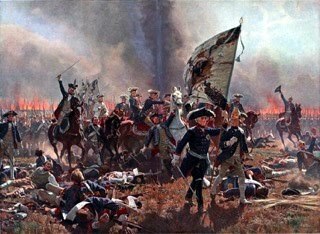 The entire Allied force under the Duke of York then retired leaving Flanders to the French. The English cavalry skirmishing with the French light cavalry vedettes. 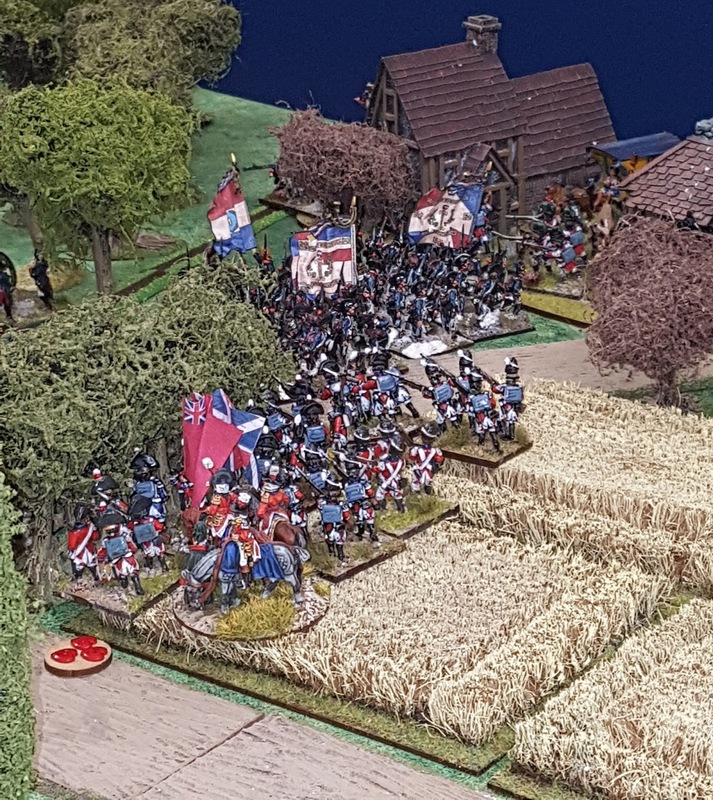 Basically, we would be fighting an encounter battle with the English trying to drive the French off the table and thus regain Boxtel. The French would be trying to stop them. We threw a dice for sides and Peter got the English. Hopefully it would be a little more lively than the real encounter. There is an order of battle using Black Powder at the end of this post. To battle! 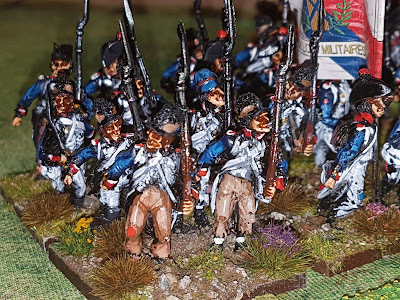 The French advance guard. The cavalry kept refusing to form up into close order and the infantry were very tardy in coming forward. To the rear, the main body of Delmas' division can be seen advancing. 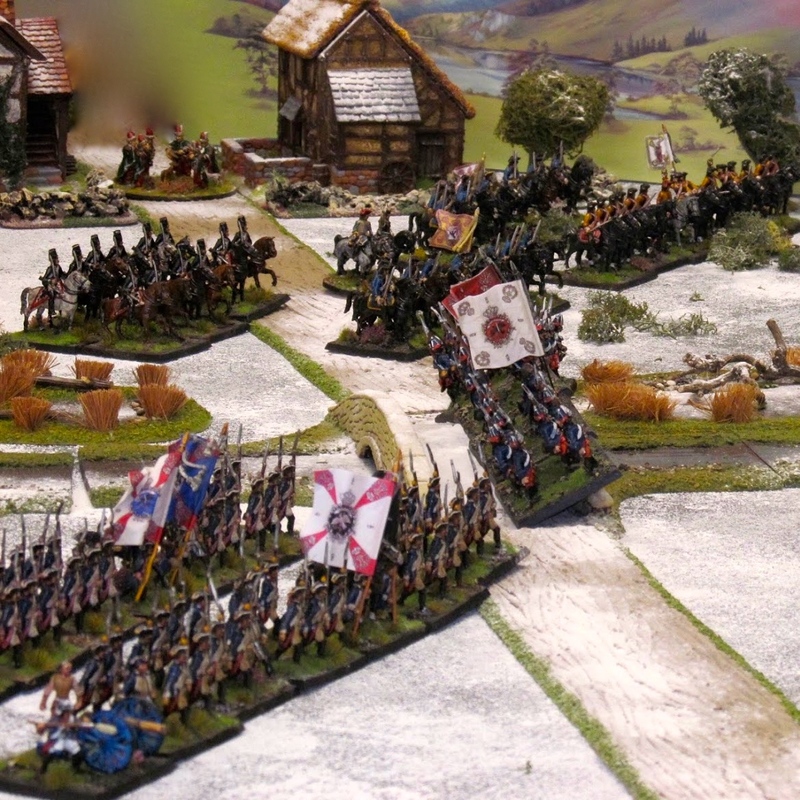 The Guards' Brigade, the combined light company battalion leading, followed by the Guards' grenadiers and the 3rd and 1st Footguards. 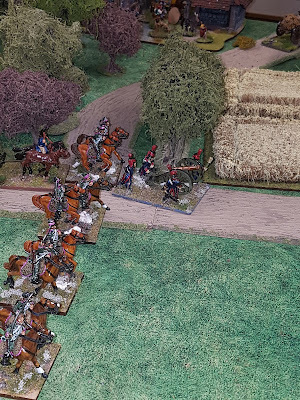 A section of horse artillery rushes forward to engage the English. 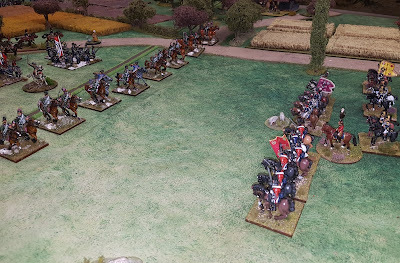 The horse artillery unlimber ready to engage the English cavalry and the advancing Guards. 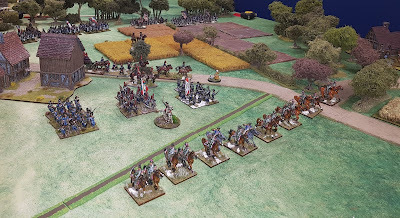 The French cavalry still refuse to form into close order. At last the main body starts to advance. 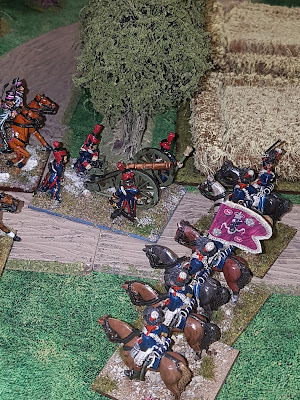 In a moment of madness, Peter launched a squadron of light dragoons against the deployed French horse artillery. Closing fire from the gun netted zero hits as I threw two 1's and a 2. At that point the gloves were off!! 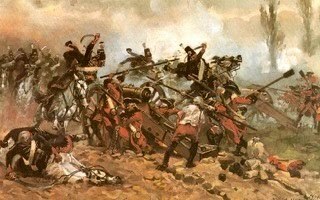 The gun was ridden down and the crew killed, after which the light dragoons wisely withdrew to regroup. 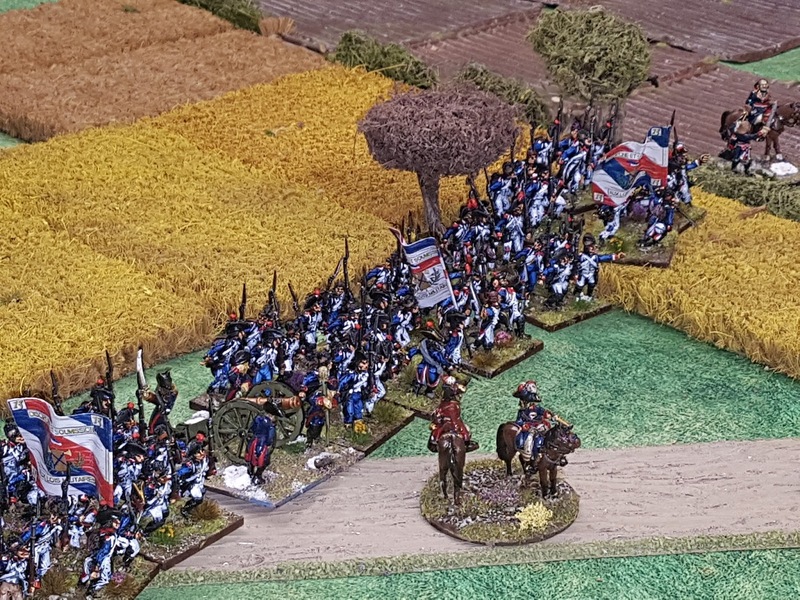 The French forces look rather intimidating as they advance en masse. The infantry of Wesley's brigade can be seen deploying on the right. 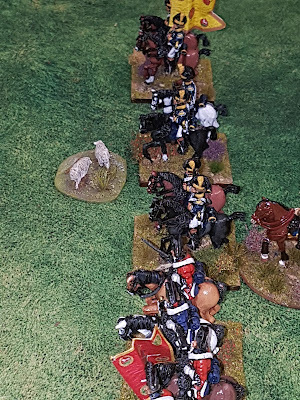 The English cavalry were left exposed for a little too long and would soon suffer the consequences. Finally the French cavalry were able to close up and their supporting light infantry were able to shot the English horsemen. One squadron was broken and the other two forced to retire. The Guards' light battalion was sent off to occupy the farm on the extreme right. Peter threw a blunder and they 'advanced' to their right. 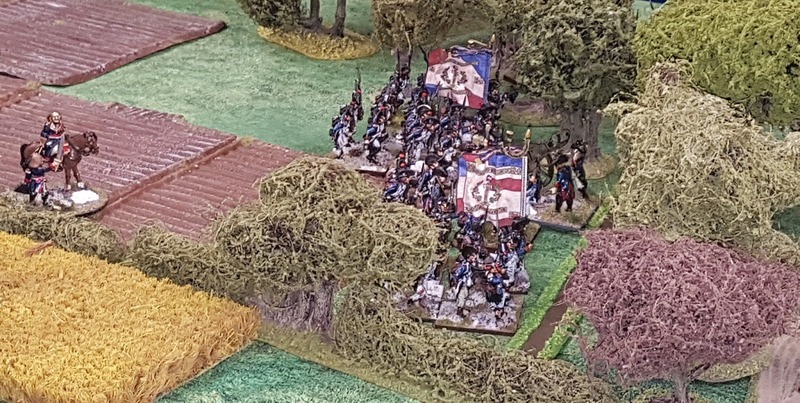 French skirmishers in the woods to their left opened fire and put them into disorder. 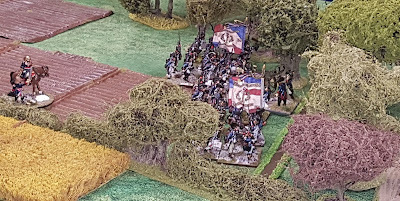 The offending French light infantry in the treelike taking pot shots at the Guards, who did eventually make it to the farm. 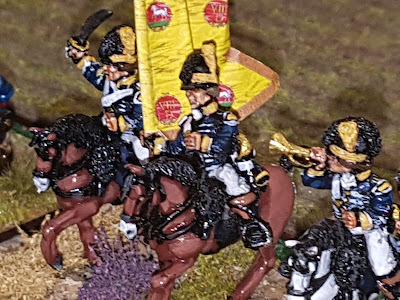 At last the main body is beginning to get close enough to engage the enemy. 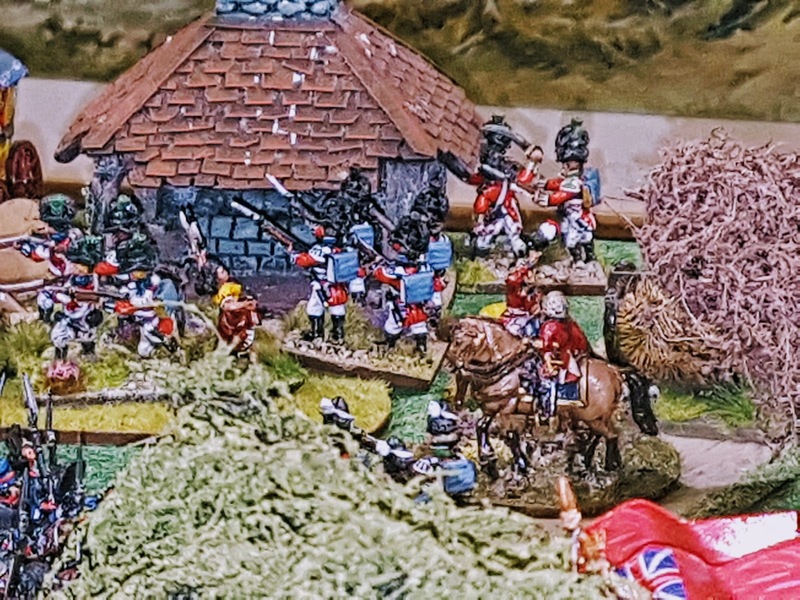 Three battalions enter the woods surrounding the farmhouse on the English right. The French assault on the farm. 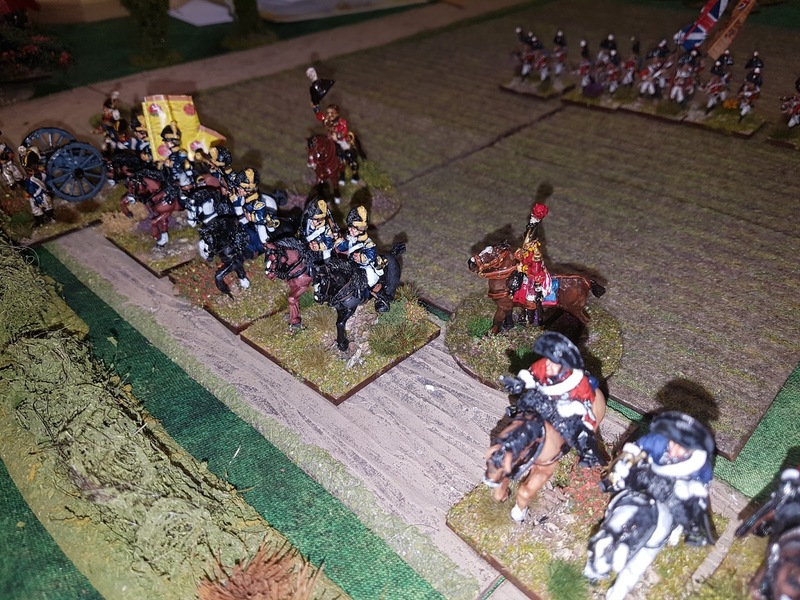 Three battalions were committed to the attack in the end. One was broken and the others failed to dislodge the Guards over the course of about four turns. 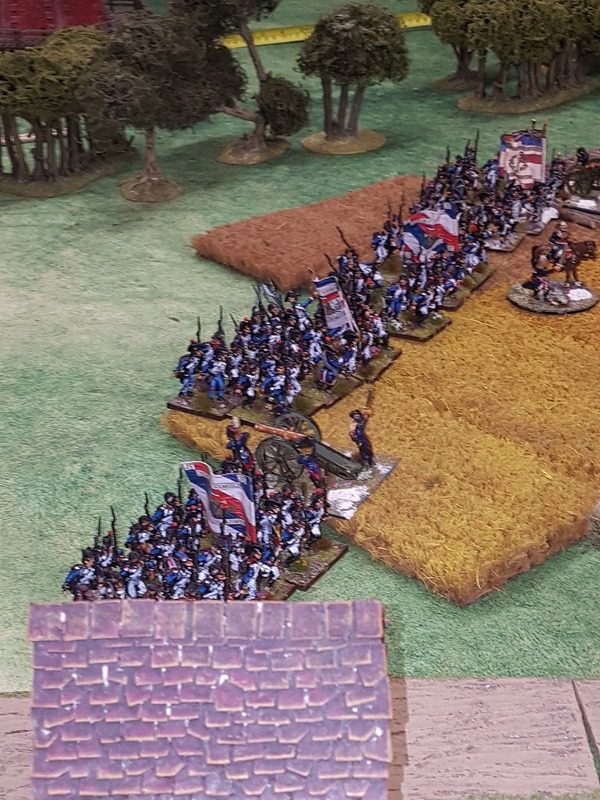 The Guards had however suffered heavy casualties and by the time the French were finally driven off were shaken and isolated. Lt Colonel Wesley (centre) waiting for his brigade to catch him up. 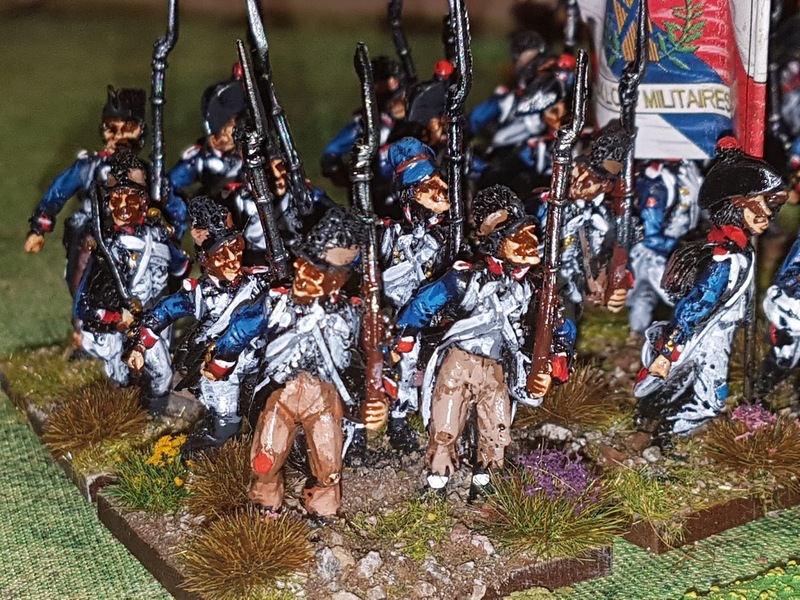 The 3rd Guards charged the French lights in the treelike, supported by the combined grenadier battalion. Abercrombie led the attack with a ''follow me!" order. 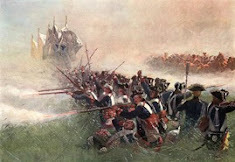 They survived the closing fire and endured several rounds of melee before the French were driven off in disorder. 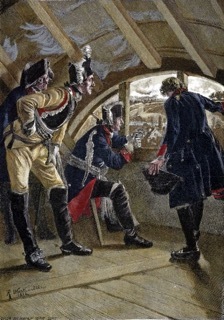 Colonel Chasse in command of the French advance guard urging his men on. 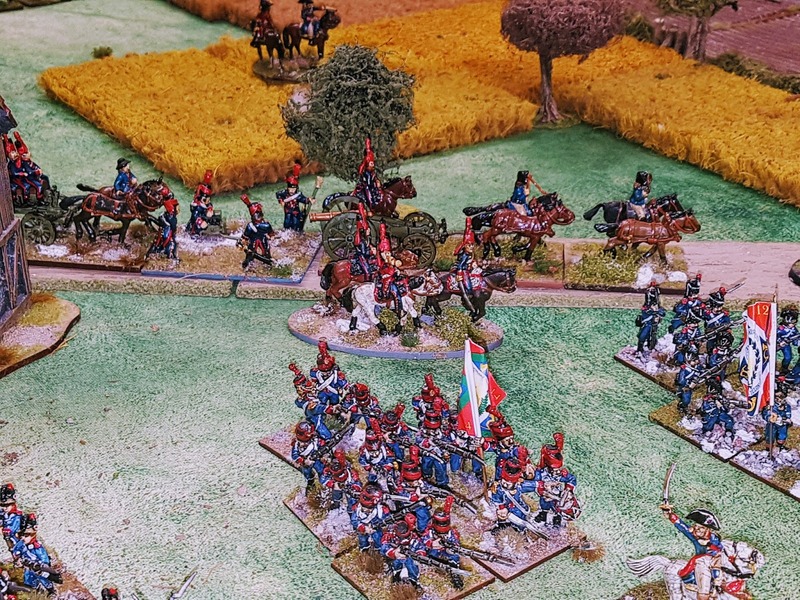 The 3rd Guards were unable to exploit their success in the treelineas they were facing two more battalions of French infantry and a light gun, which drew up to within canister range. The Guards didn't last long under this withering fire, suffering as they were from the aftermath of the melee, and soon fled. 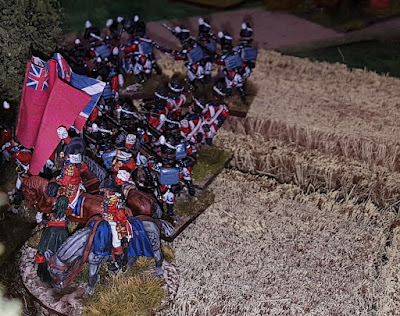 The Guards' grenadier battalion charged the French column in the flank and would eventually drive them back, but by this time the battle was lost and the English army was trying to extricate itself. The Guards barely hanging on and about to break. 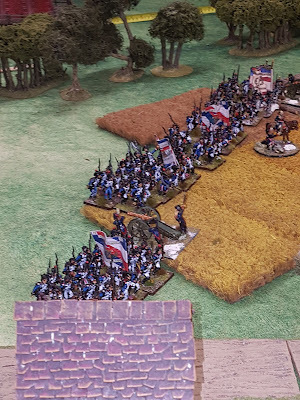 The French commander orders a final attack to drive off ze feelthy English Aristo-led lackies. 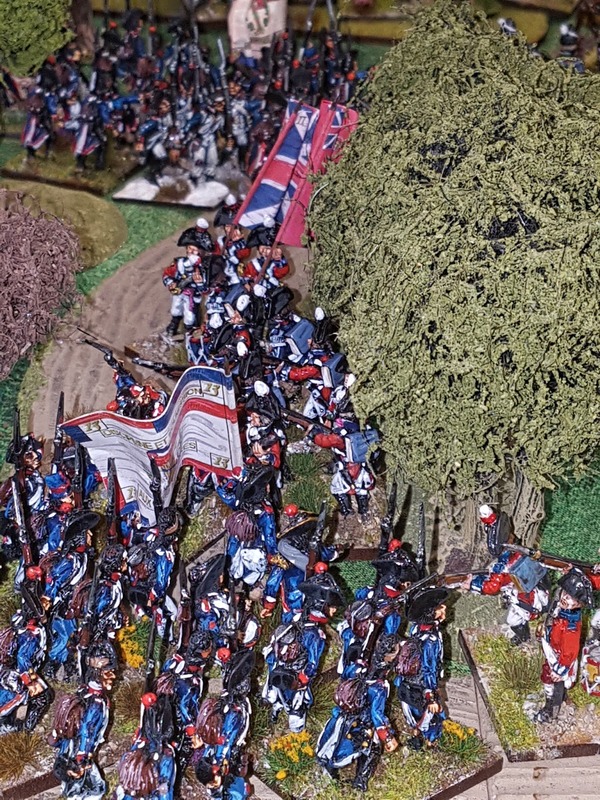 Wesley's brigade had not made much of an impact on the battle. One battalion was broken and another badly shot up by two battalions of French and a cannon. There remained lonely one thing to do; cover the retreat of the Guards and the remaining infantry and artillery with the surviving cavalry. 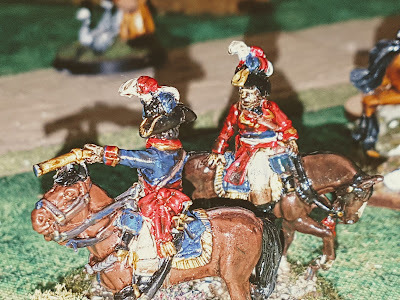 Abercrombie orders the army to withdraw. He was notoriously short-sighted which contributed to him failing to get a grip on the battle and deploy his troops effectively. The battered Guards' light battalion had defended the farm for much of the battle but, a biter pill to swallow, they would now have to give up their position and withdraw. 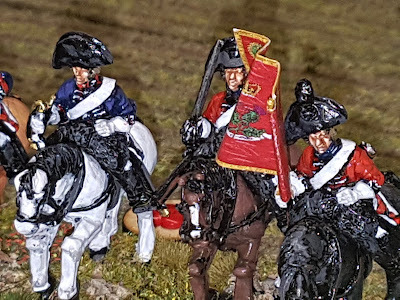 The surviving light dragoons prepare to cover the retirement. As do the Kings Dragoon Guards. 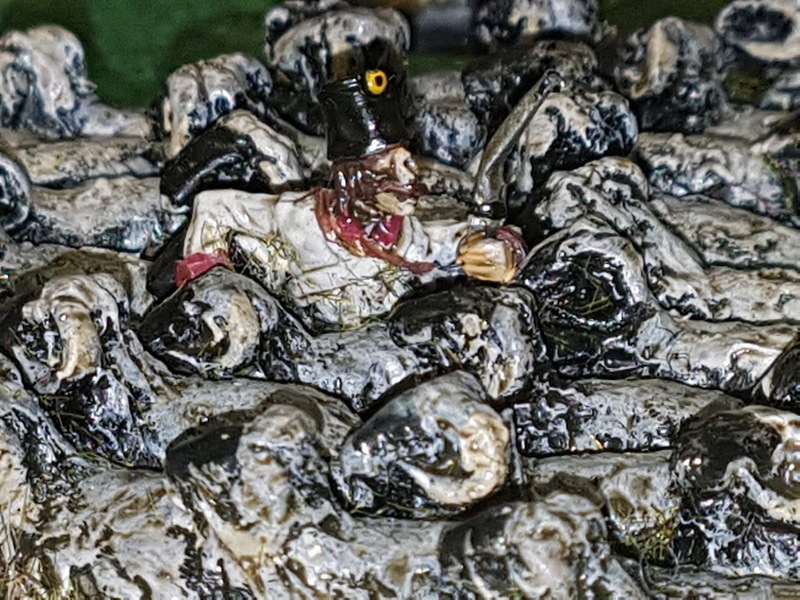 A Hapsberg spy in among the sheep. 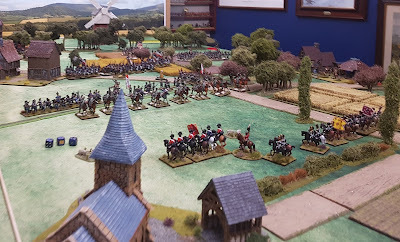 We called it a day there as the English army was pretty much shattered. However, the French were in no condition to pursue effectively as many of their surviving units were hanging on by a hair's breadth and their only cavalry unit was shaken. I think in fairness the English were always going to have a tough time of it, but although they lacked in quantity their infantry (the Guards at any rate) and cavalry were far superior to their French counterparts. In the end though, some extremes of dice throwing, i.e. throwing the wrong result at the wrong time or vice versa if it and a couple of errors on Peter's part (he'd not had a game for several months and was a bit rusty) put victory out of reach for the English. 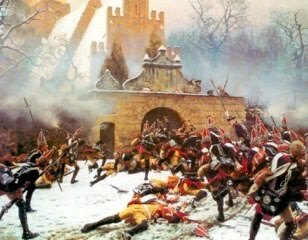 As promised here is the order of battle. 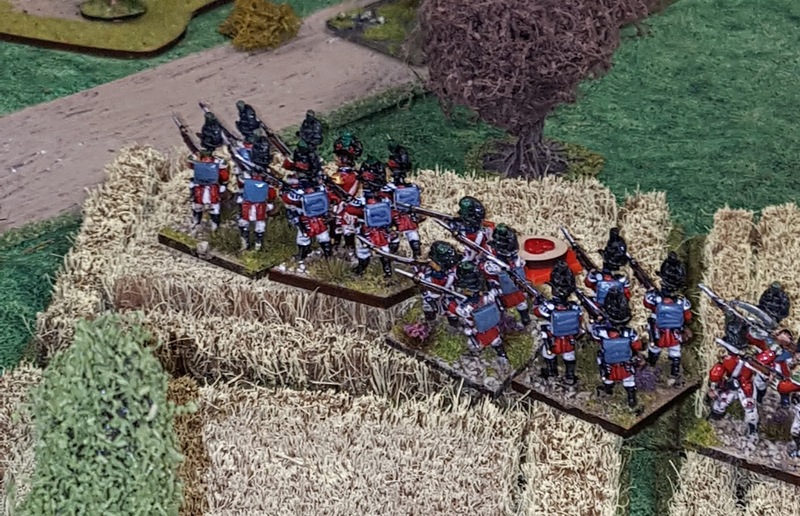 The English commanders have been graded 7 due to their lacklustre behaviour on the day. Lovely stuff! It's great to see this campaign on table, I'm very tempted! Frustratingly nice to see what a difference those command values of 7 make. Much enjoyed - thanks. 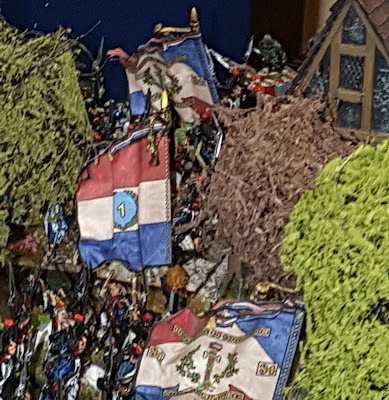 Nice game Colin, your British command group looks great, fantastic paint job! thanak Neil. A little secret. I didn't paint the command group. Wonderful report. I wish I was there! Superb looking game and a good one by the sounds of it. well done. cheers Paul. It was certainly fun.....for the French at any rate. Epic! 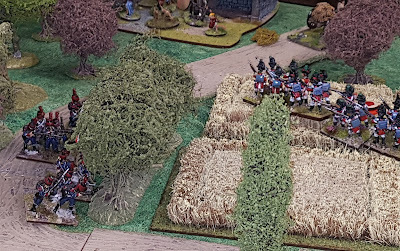 Beautiful terrain and figures, great close ups, and the end (the spy in the sheeps and the unfornate general) is a fantastic idea...Excellent report! Phil. you are very kind. Colin, thanks for buying my book. It great to see the game on the table. My blog has pictures on my 15mm game which I have taken to several shows. It is a fascinating encounter which encourages a more cautious approach from both sides. 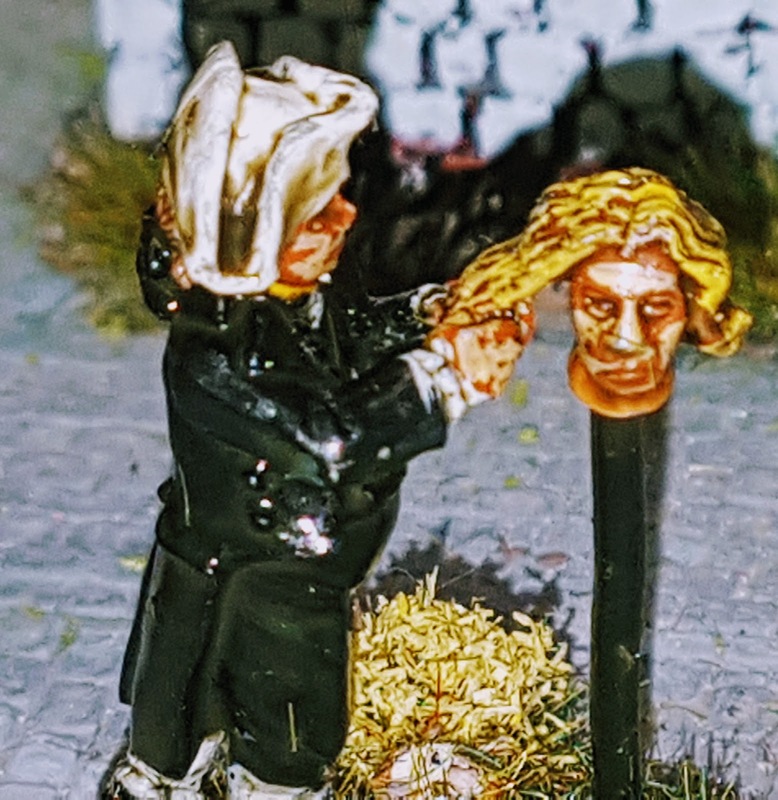 Congratulations on your blog it is always enjoyable. I managed to miss this somehow! Well up to the mark though!